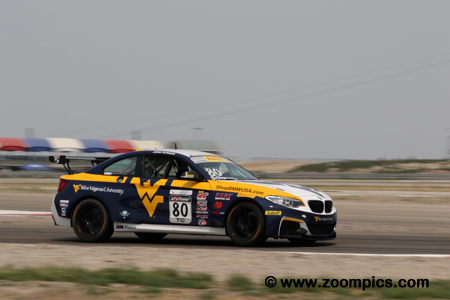 Rounds nine and ten of the 2018 Pirelli World Challenge Touring Car season took place during the Grand Prix of Utah. 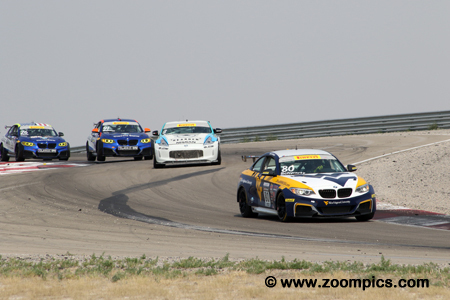 Thirteen drivers competed in the two forty-minute races around the Utah Motorsport Campus’ fourteen-turn 3.048-mile ‘Outer Course’. The Touring Car pole-sitter, Johan Schwartz driving the Rooster Hall Racing BMW M235iR leads the field through ‘the Attitudes’ on lap one of round nine. His first place was short lived as he was deemed to have jumped the start by series officials and was given a ‘pit lane drive through’ penalty. Behind Schwartz are the eventual top three finishers - Vesko Kozarov, Karl Wittmer and Matt Travis. 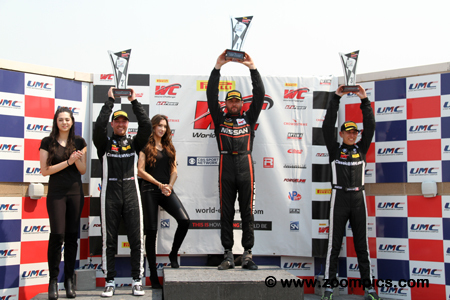 The round nine Pirelli World Challenge Touring Car podium at the Utah Motorsports Campus. On the left is the runner-up Karl Wittmer and to the right is his Classic BMW teammate, Matt Travis, who captured the final position on the rostrum. Between these two is the winner and point’s leader, Vesko Kozarov. This was Kozarov’s fifth victory of the 2018 season. 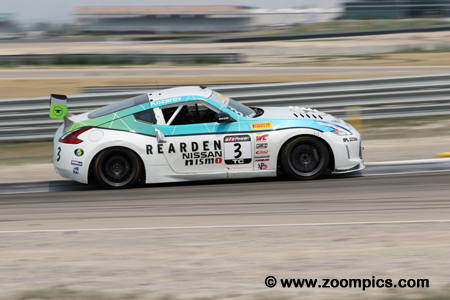 The first lap of round ten at the Utah Motorsports Campus and leading the field through ‘Release’ is the point’s leader and pole-sitter, Vesko Kozarov driving the Rearden Racing Nissan 370Z. Trailing Kozarov is the third place starter in the Classic BMW prepared BMW M235iR, Karl Wittmer. Behind Wittmer is the other front row starter, Johan Schwartz driving the Rooster Hall Racing BMW M235iR. 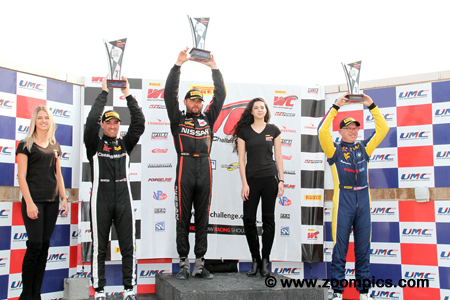 Utah resident, Vesko Kozarov has dominated the Touring Car division during the 2018 Pirelli World Challenge season. In the first eight events, Kozarov has four victories and leads the title chase. In qualifying for the weekend’s first race, he was only third quickest but that seemed of little consequence as Kozarov grabbed the lead early and drove away from the field. Starting on the pole Sunday, he won his sixth race of the year. Quebec competitor, Karl Wittmer is second in the Touring Car standings as the result of a single victory at Lime Rock and podium finishes in the other rounds. During qualifying for Saturday’s contest, Wittmer recorded the second fastest time. In round nine, he lost a position to Kozarov but gained it back when Schwartz was penalized and took the runner-up spot. In round ten it was much of the same – Wittmer finished second. One of the four Classic BMW entries was driven by Matt Travis. Driving the No. 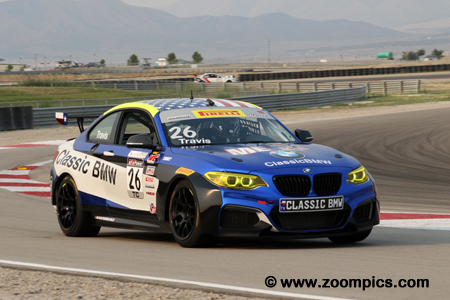 26 BMW M235iR, Travis was gridded fourth for the start of the weekend’s first race. Benefitting from the penalty to Johan Schwartz in Saturday’s event, he was able to grab the final spot on the podium. In the weekend’s finale, Travis started and finished fourth. The No. 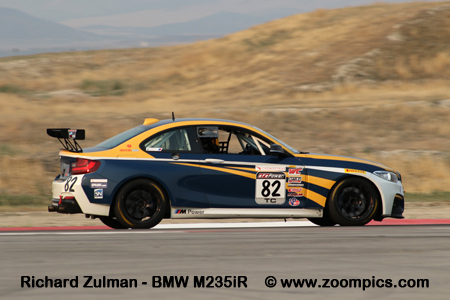 80 BMW M235iR driven by Johan Schwartz qualified on the pole for the season’s ninth event. In the process, Schwartz set a new lap record. In Saturday’s race, he was given a ‘pit lane drive through’ penalty for jumping that start. Schwartz charged through the field and finished fourth. In round ten, he started on the outside of the front row but could not hold off Karl Wittmer and was third at the checker. TechSport Racing’s Steve Streimer was one of four drivers that had a Touring Car victory to his credit in 2018 – capturing his lone win at VIR. Unfortunately, the driver of the No. 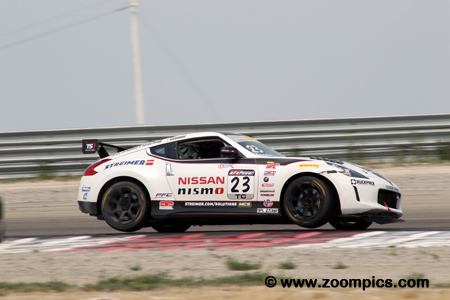 23 Nissan 370Z had mixed results at the other events. 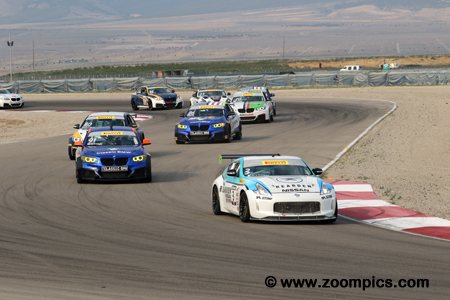 Streimer was gridded sixth for race one at the Utah Motorsports Campus and lost a position before the end of the event. On Sunday, he started and finished eighth. The top-three Touring Car finishers in round ten at the Grand Prix of Utah. In the center is Vesko Kozarov who captured his sixth win of the season and has built up an almost insurmountable points lead heading into the final two events. 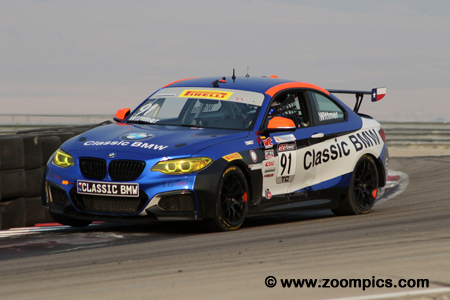 To Kozarov’s right is the runner-up from Classic BMW, Karl Wittmer. And, rounding out the top-three is the driver of the No. 80 Rooster Hall Racing BMW M235iR, Johan Schwartz.